I'm drenched in sweat, exhausted and sore. And I feel great about it. I'm arriving in one of the most beautiful places in Thailand and I've worked extremely hard over the last six days to get here. When I hit the beach this afternoon and get a cocktail delivered to my sun lounge, I'll be doing so with the distinct feeling that I deserve it. Yes, 'fly and flop' is fine for some. You work hard at your job and when it comes time to take a holiday, all you want to do is fly into your destination, get your transfer to the resort and do nothing for the rest of your break but lie by the pool and relax. But, as I discovered, there's much to be said for making the journey a more rewarding experience than the destination. 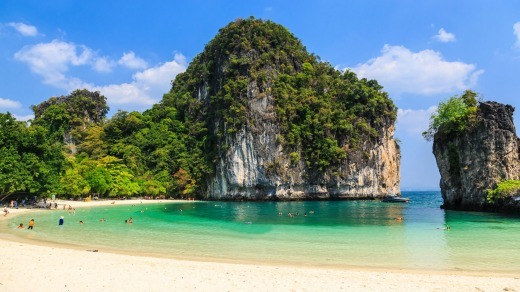 My location is Krabi, the coastal town adjacent to some of the world's most beautiful island beaches and flanked by spectacular limestone cliffs. 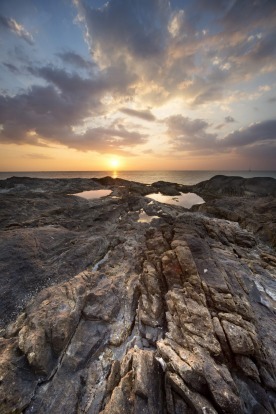 It's a stunning destination and one of Thailand's key attractions for overseas visitors. But getting here hasn't been easy. Yes, Krabi has an airport so takes little effort to fly in from Bangkok (taking little over an hour). 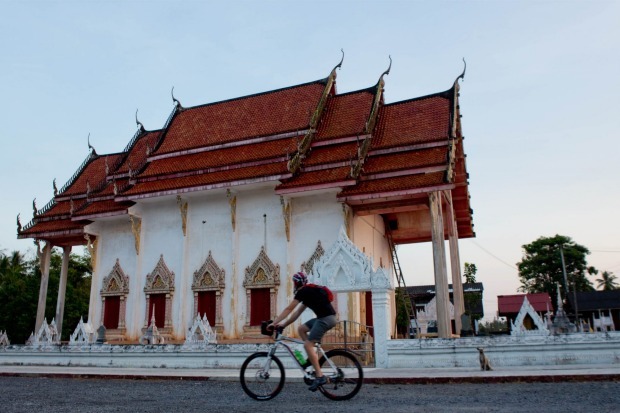 I, however, have taken six days to arrive, covering 380km on a bicycle across the peninsula from the Gulf of Thailand in the east to the Andaman Sea in the west. I don't consider myself particularly fit, but I do cycle eight kilometres to work on a regular basis. Unfortunately I find this doesn't really count as 'training' when we're travelling up to 85km per day. 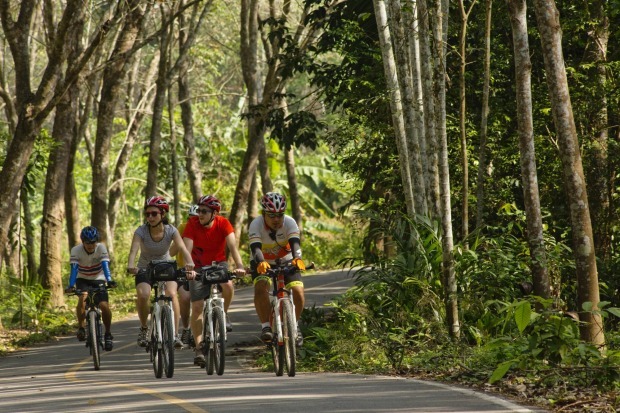 The journey, through cycling tour specialists Grasshopper Adventures, is titled "Koh Samui to Krabi", though technically it begins in the town of Surat Thani (it's not possible to actually depart on your bike from Koh Samui, since it is an island, but cyclists on this tour will typically spend a night or two there before taking the short ferry ride to the mainland). 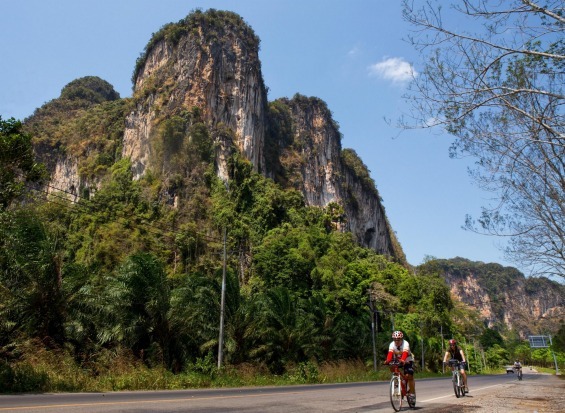 As a destination, Surat Thani has little to recommend it, other than, on its outskirts, an opportunity to see how local Thais live when they're not involved in the tourism industry. On our first evening we meet our guides, Tick and Woody, the former stocky but with thighs like tree trunks, the latter lithe and muscular. Their obvious fitness levels make me a little nervous. 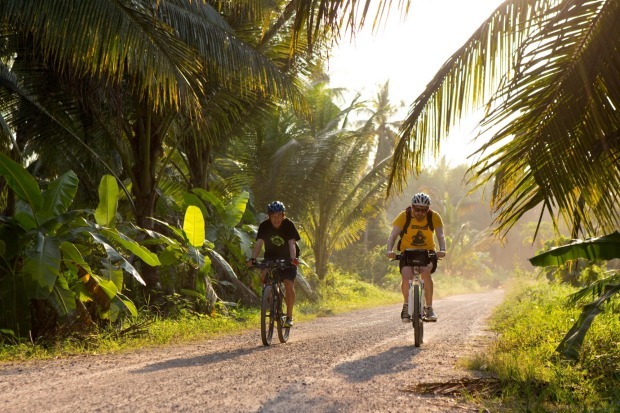 They take us out for a brief warm up ride in the evening where we head out of Surat Thani and to the countryside, passing coconut farms and and rubber plantations on the way before arriving at a small village for dinner. This is our first taste of what will be one of the trip's other highlights besides the ride - the food. It turns out Tick is a former chef and Woody is also a foodie, both obsessed with finding the best meals in each place we visit. We're quite happy to let Tick take the lead and order food on our behalf, which pays off handsomely as the trip goes on. 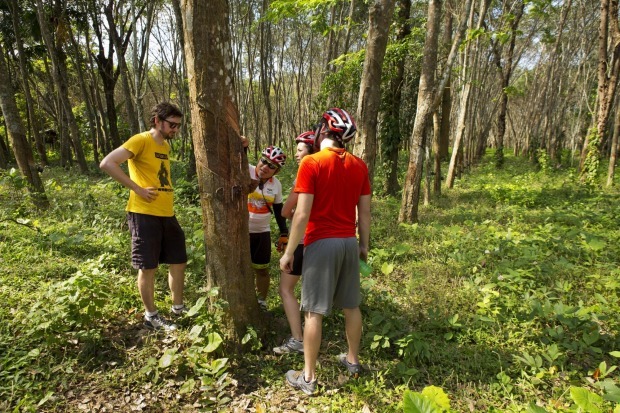 "Cycling is a hobby," says Woody at one point. "Eating is a full-time job." And eat we do. Starting off the first day with an 85-kilometre ride, we quickly learn that this trip will have us working up big appetites. We stop at roadside stalls and tiny cafes during the day, in areas where tourists are few and far between. 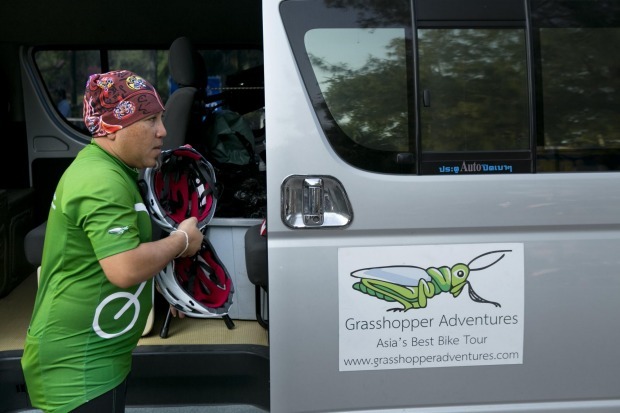 Grasshopper provides the bikes, helmets and a support van for the tour, which carries our luggage, snacks, drinks and repair kits. 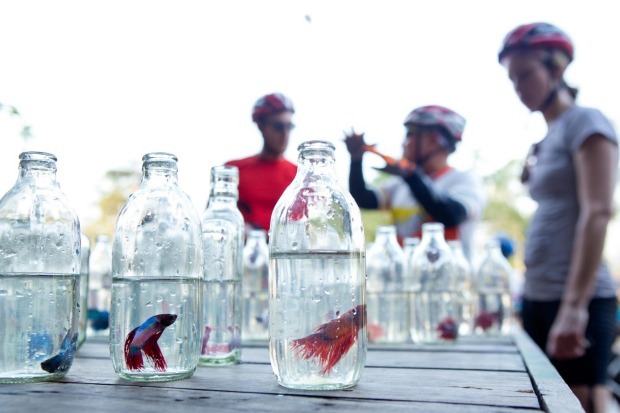 The van is also an option for any riders who feel like they need to take a rest. I resolved not to give in to temptation and resort to this, but after the first day I'm not so sure I'll be able to make it. 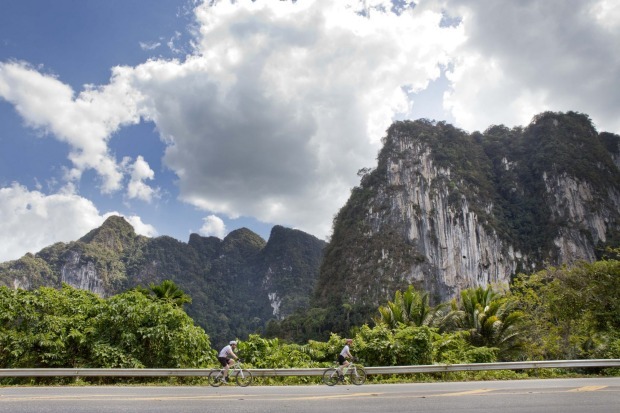 From Surat Thani we head to the scenic Ratchaprapa Dam before heading into Khao Sok National Park. 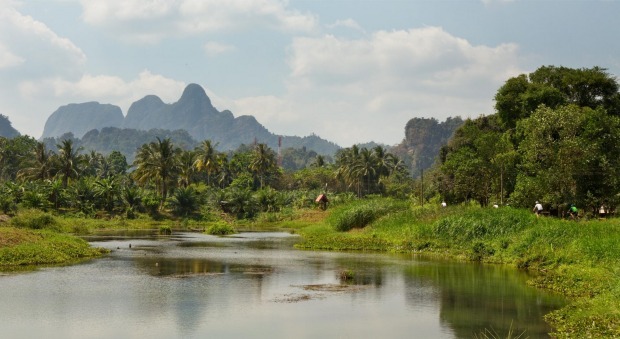 Here the landscape begins to change, becoming more rugged and we begin to see signs of the limestone peaks for which this part of Thailand is famous. 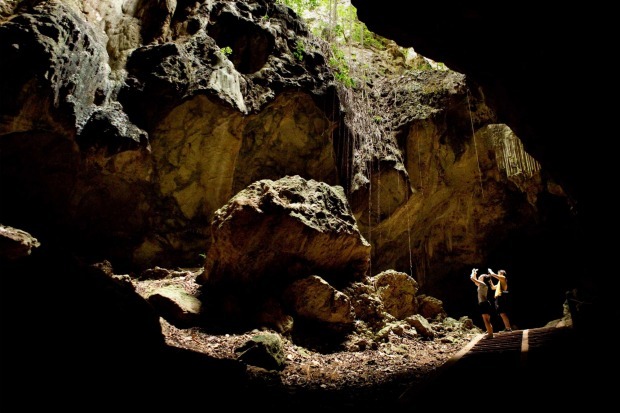 The cleverness of the structure of this trip means that the further we go, the more beautiful the scenery becomes, and the better the accommodation gets. 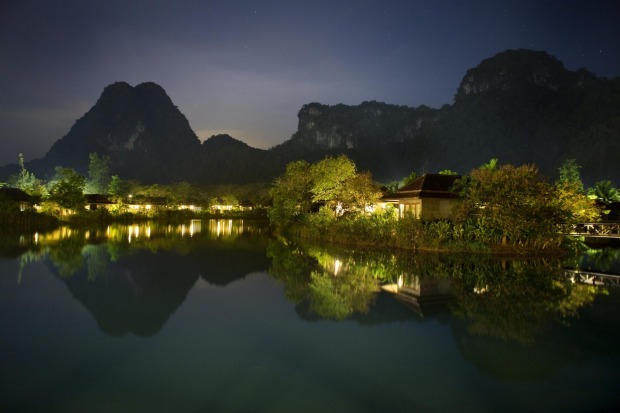 Starting from a town and region that is not particularly popular with tourists means the initial hotels are more on the rustic side, but when we hit Khao Sok National Park we spend the night in the beautiful Our Jungle House, a series of private villas (some of them elevated treehouses) on the banks of a river and flanked by a huge, sheer cliff face. From there, we head towards the coast and Khao Lak. 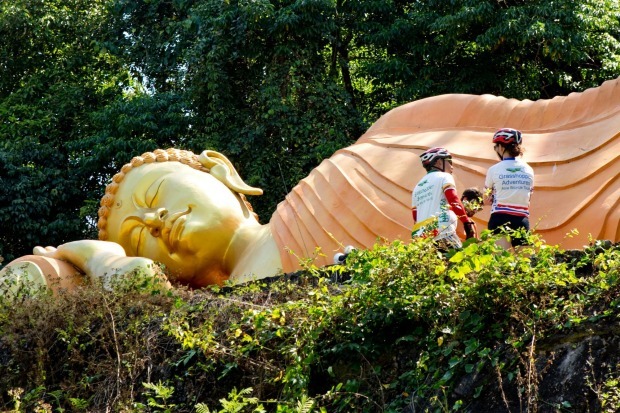 The morning starts with a 6km climb, the hardest part of the entire trip, but is also one of the highlights. While it takes us an hour to make it to the top of the hill, it takes just six minutes to come down the other side, an exhilarating, curving journey we do at top speed. Our rest day, day four, comes not a moment too soon. We arrive at a large resort in Khao Lak and have two nights here, allowing us a chance to hit the pool and the beach, as well as get some general relaxation. I can scarcely believe it myself, but I find myself hitting the resort gym's exercise bike for about 30 minutes just to keep my leg muscles from tightening up. The other surprise is that I don't really have any pain in my legs, just some tiredness. Maybe those short commutes to work conditioned me more than I thought. 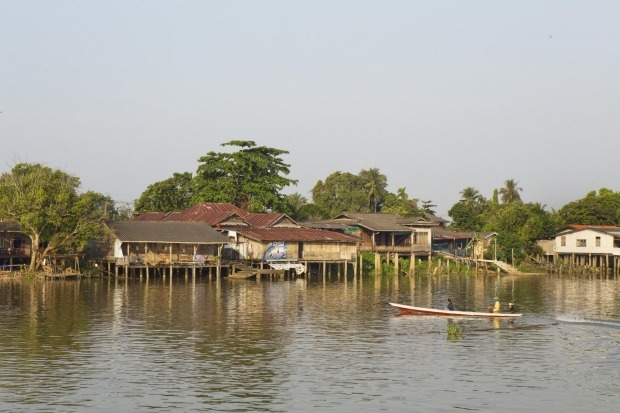 After our well-earned rest, we head back inland and south towards Krabi. If anything, the heat has become more intense close to the coast (possibly due to a lack of shade outside the national park) but as we get closer to our goal our group feels re-energised. The peaks become more common, larger and more impressive. They jut from the landscape in dramatic fashion, looking like something from an alien landscape. 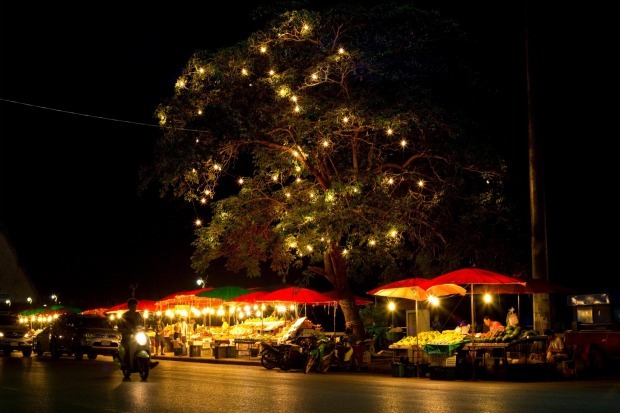 Our final night of the trip, before arriving in Krabi, is a highlight. 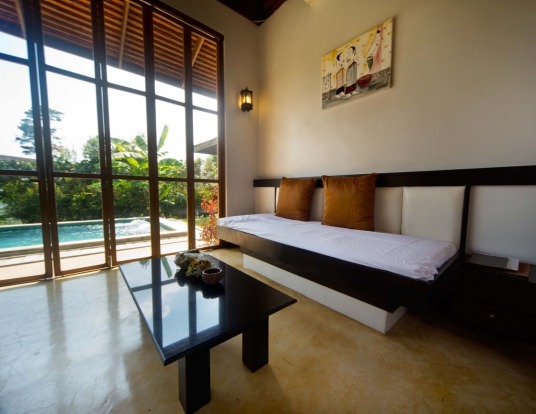 We arrive at our accommodation - Bor Saen Villa & Spa in Phang Nga - to find that we have self-contained villas, complete with private plunge pools. I've stayed in places with private plunge pools before, but never have I been so happy to see one and (after quickly showering off the excess dirt) I'm plunging with joy. But this is not the only highlight on our last night together. 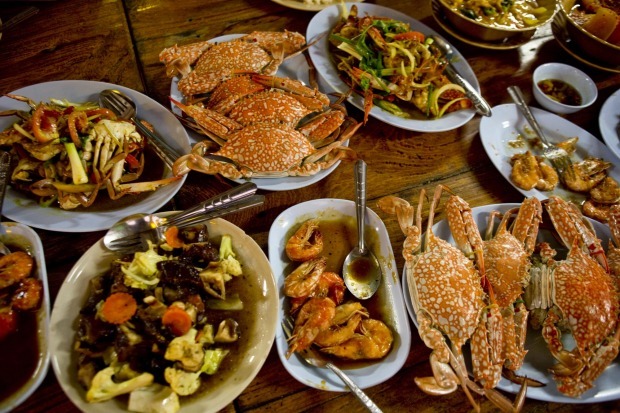 Tick, being the foodie he is, takes us to the small fishing village of Bang Pat. The Muslim community lives on stilted houses on mud flats and makes its living through selling fish and seafood, but some enterprising members of the community have set up a restaurant here, and after a tour of the village, Tick orders a final feast for us here - prawn curries, mud crabs, fried fish. The food keeps coming, but after our hard-earned journey we manage to finish it all. 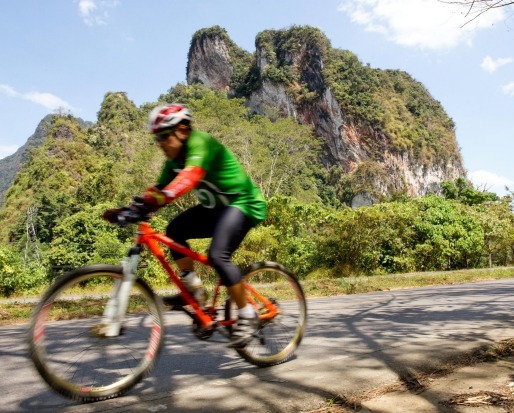 The next morning we have a half-day's ride to our final destination: Krabi. 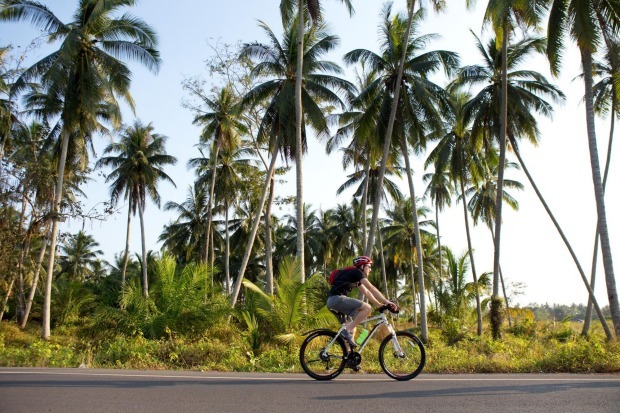 The coastal town is a tourism hotspot and the launch point for day-trips into Phang Nga Bay, via longtail boats, to some of Thailand's most beautiful islands (including the islands where The Beach and The Man With The Golden Gun were filmed). Our journey is at an end and we've arrived at a place where relaxation is the focus as our group separates and heads to the various resorts we have booked. Here, I'll take some time to sit by the pool and explore the islands and their spectacular beaches. The weird thing is, after six tough days of cycling and 380 kilometres covered, I'm disappointed it's over. Getting up early and getting on the bike has already become such a habit I find myself wishing I'd be doing it again tomorrow. I guess I'll just have to try and make up for it by cycling the less-impressive Beach Road in Melbourne back home. Who wants to go for a ride? 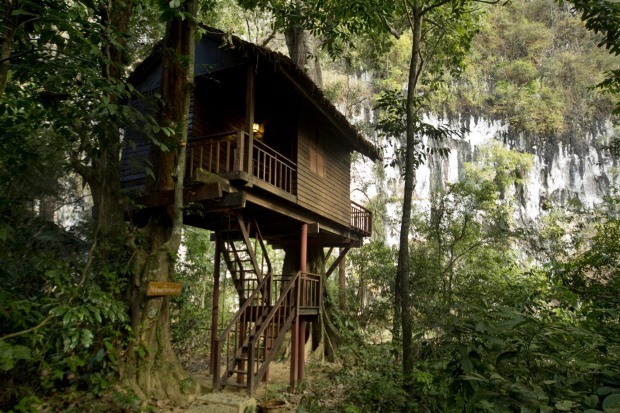 The writer travelled as a guest of Grasshopper Adventures and the Thai Tourism Authority.